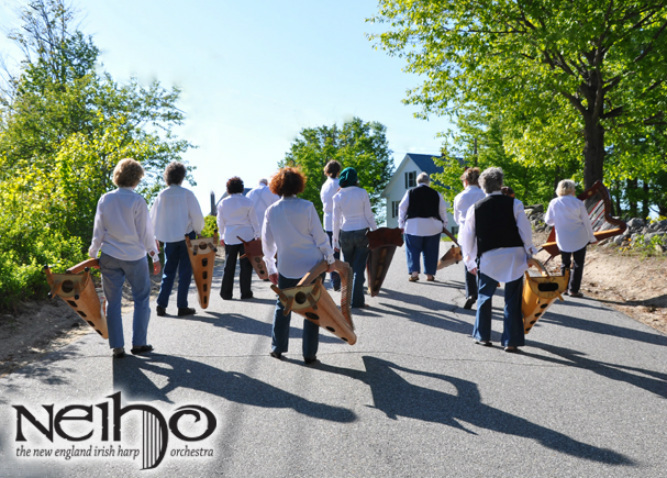 Welcome to the New England Irish Harp Orchestra website. We are many harps and harpers with a shared vision of playing great music and having fun doing it. We launched our newest Holiday CD - 'A Snowy Path' this past December. We have many other instruments on this CD along with the harps. Please email if you'd like to purchase one. HAPPY 15TH ANNIVERSARY to The New England Irish Harp Orchestra. 2019 marks the 15th year we've been harping together. We're planning a big reunion concert 15 June 2019 at The Burren in Somerville. Will keep you posted about that. In the meantime, we have our St. Patricks concerts coming up this March. We'll be at The Bedford NH public library on the 10th; at Memorial Hall in Melrose, MA for two concerts on the 16th; and at The Milton Club (a brand new venue) on the 17th. Please see our calendar for details. Regina will be having her Summer harp camp in Acton, Maine 18-20 July. Email her for details. Please email if you'd like to book either the Ensemble or Orchestra for your special event. If you are interested in becoming a part of the Orchestra please email me! As always, thank you for all your interest and support.